I read today about the recent re-hospitalization for Tori Spelling after her fourth c-section (and her second within one year). I think we hear a lot about the risk of VBAC. A LOT. And it is true, there are more risks to VBAC (vaginal birth after cesarean section) than in a straightforward vaginal birth. 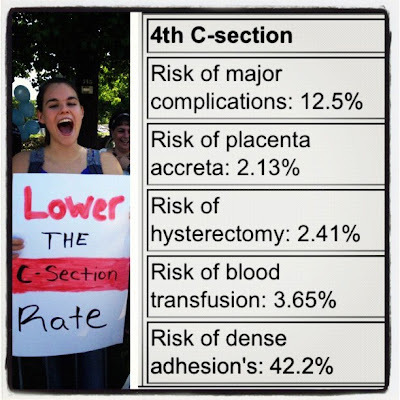 While fear runs high for VBAC, we hear very little about the risks of repeat cesarean section. These risks can't and shouldn't be ignored. There are many good reasons to have a c-section, even a scheduled c-section. But we need to be honest about this procedure. It is a surgery. It is a major surgery. Even the Mayo Clinic (and numerous other physicians) recommend that a mother not have more than three c-sections because of the increased risk to the mother. "Weakened uterine wall. Each uterine incision leaves a weak spot in the uterine wall. This might interfere with future pregnancies. Problems with the placenta. The more C-sections you've had, the greater the risk of developing problems with the placenta — such as when the placenta implants too deeply and firmly to the uterine wall (placenta accreta) or when the placenta partially or completely covers the opening of the cervix (placenta previa). Bladder injuries. Bladder injuries, which are possible but uncommon with initial C-sections, are more likely with repeat C-sections. The increased risk is likely due to scar-like tissue that developed after a previous C-section, binding the bladder to the uterus. Heavy bleeding. Heavy bleeding is possible after any C-section. The risk of excessive bleeding increases with the number of repeat C-sections. The risk of needing a hysterectomy — removal of the uterus — to control life-threatening bleeding also increases with the number of repeat C-sections." "The risks of placenta accreta, cystotomy, bowel injury, ureteral injury, and ileus, the need for postoperative ventilation, intensive care unit admission, hysterectomy, and blood transfusion requiring 4 or more units, and the duration of operative time and hospital stay significantly increased with increasing number of cesarean deliveries." Are there risks to VBAC? Yes. Are they as big as the risks of multiple c-sections? That is a VERY good question and one probably not discussed with the vast majority of c-section mothers. WHY AREN'T WE TALKING ABOUT THE RISKS OF MULTIPLE CESAREAN? WHY? Picture provided by Abby Robinson, a VBA3C mom and taken at an Improve Birth rally in Texas. The above quoted study ends by talking about how women should simply LIMIT their family size due to the risk of cesarean. I find that conclusion offensive and patriarchal. Women everywhere must limit the number of dangerous children they have because they were operated on? Even if this operation was unnecessary? This is simply a ridiculous solution- ESPECIALLY when we have ANOTHER option to having a second or third or fourth cesarean. That other option is VBAC and it is VERY real and very safe. I hurt for Tori and her family and I wish her a speedy and total recovery and joy in all her births and babies. Her hospitalization from complications after her cesarean is sad and tragic and it shows us that even celebrities with the best doctors and the nicest hospitals cannot escape the very real dangers of modern obstetrics and the c-section epidemic. If you would like to read a comprehensive review of the research on vaginal birth after multiple c-sections I highly suggest you read an ENTIRE post by the talented Abby Robinson, a VBA3C mama. Not so great for me unfortunately as I have to have a third caesarian. I have a condition called Cholestasis which is a liver condition and means basically that you have to deliver between 37 and 38 weeks. As I have had previous sections then I can't be induced therefore Caesarian is the only option. We did however try for a VBAC second time around only to be diagnosed with Cholestasis. I dont have the right shaped pelvis, could not even pass my son who was 3 lbs.. I have to have a c-section, would love a natural birth, but it' s not in the cards for me. When I had the "VBAC talk" with my provider, it was all about how risky a VBAC is and not so much as a word about the risks of a repeat c-section. As our "lecture" continued it was me who brought up the risks of cesarean. His response was that he could control those things!... I have a friend who has had 4 c-sections, she was told no more than 3 and with her third they found her wall to be very thin. They took her 4th early to prevent a rupture. I think it is very irresponsible for doctors not to support VBAC and at the same time act like cesarean birth is no big deal. It is becoming a HUGE deal as our numbers plummet and prove that the cost of cesarean birth is high all around. As the blogger stated, there are valid reasons for cesarians, such as a medical condition, preeclampsia, placenta previa, and a true problem with the pelvis, etc.-thankfully cesarians exist and are life-saving for mothers and babies under those circumstances.For me, I had 3 normalpregnancies deliveries with no issues, then my health provider for my 4th child insisted I should have an induction because "the baby is going to be very large". I listened to her, the induction (at 40 weeks) failed, and I had to have an emergency c section. My baby was 8.5 lbs, hardly gigantic and only a little bigger than my previously vaginally birthed biggest child. After that c section, I had difficulties becoming pregnant or sustaining a pregnancy.I had two miscarriages within 12 years and no other pregnancies, despite not using birth control.Finally, 13 years later, I did get pregnant and carried almost to term my newest baby, who was just born on September 14, 8 weeks early, by VBAC. She weighed 5 lb 14 oz and measured 19 inches long. I am grateful for a doctor who believes in the process of birth and did not force me to be cut open again. Everything went smoothly and baby is doing really well in the NICU, breathing on her own and being fed my expressed milk. And because I am not recovering from major surgery, I am able to go see her every day. Cesarians for real medical reasons are a God-send, the problem in this country is the many cesarians that happen for convenience of the doctor, or as a result of unneccesary interventions which cause a cascade down that ends in a c-section. Thank you for this. I feel for that small percentage of women for whom vaginal birth is simply not an option, and I count my blessings that my OB kept a cool head with my mildly-distressed (cord around neck) son, when I'm pretty sure most others would have taken him by C.
Yes, there are risks to having multiple C-sections. However it is not accurate to present VBAC as the alternate because it may not be a viable alternate. Further the number of women who in a given pregnancy encounter obstacles to vaginal birth is not small. Further still, some of the risks that you have assigned to C-section should properly be described as risks incurred with vaginal birth as well. Bleeding, bladder injuries, etc. -- talk to anyone who has had a fourth degree tear or severe pelvic floor injury. You really have to be honest here. I hope Ms Spelling is home enjoying her baby by now. Ya know Terri- I am of the mind that it goes without saying that a normal vaginal birth (and by that I mean natural, not induced with drugs and mom on her back and baby yanked on) is simply less dangerous than major surgery. It just makes sense to me. Yes, of course there are risks to vaginal birth- it is a big deal no doubt. But- you lose more blood (fact) when you are cut open. In addition, some of the risks of vaginal birth you point out (bleeding, severe pelvic floor damage, etc) are actually much aggravated by the intervention happy model of care. For example- pitocin in labor increases the chance of hemorrhage postpartum. Another example, 3rd and 4th degree tears are rare (less than 10%) in all births. But when you talk to home birth midwives (who deliver women allowed to position themselves as they wish) many have NEVER seen a third degree tear. Those kinds of things DO happen, I will grant you that. But they happen more when we are intervention happy. And yes, I still believe VBAC is a very good option mist if the time. You simply won't convince me otherwise. We are not allowing women to attempt VBAC because of a less than 1% chance of rupture BUT then we subject them to risks much greater by subjecting them to one cesarean after another. This is a topic that nobody is talking about and women deserve to know about it. Cesarean isn't risk free. Vaginal birth isn't either, but it sure as heck is safer than numerous c-sections. That is a fact. Hi! I am a midwive in South Africa. I find this blogs very informative. Our c/section rate is quite high. Not sure of the statistics.I just wish I can get the doctors around here to see what they are doing. They start inductions for post dates at 40weeks. And then take about 80% of those woman for c/s for failed induction or poor progress. They don't do any Bishop scores. It realy is a nightmare. I work in a teaching hospital so its like they cause reasons for c/s to get their procedures in. Also VBAC's are rare. Mostly because they do not diagnose labour properly so again failure to progress and repeat c/s. And after 2 cuts they do not allow VBAC. And after 3 they "advise"
sterilization. And we as midwives don't have any say. It's the doctors way or no way. Very disempowering for us. Oh and its not OB/GYN's most are interns or residents. This is the myth of cesareans being 'easier'.There are risks to cesarean section!. no one ever talks about the risks of repeat c-sections, just the 'risks' of vbac. Thank you mama birth, for another great post. Whenever I write about it on our site I get lots of "Cesareans save lives!!!!" and tsk tsking, and "But MY BABY AND I WOULD HAVE DIED." Okay! Yes! This happens! I'm not talking about taking away women's choice to have a cesarean if she wants one, nor am I advocating anyone die for lack of a cesarean. Just a realistic look at both the risks and benefits of both VBAC and CBAC. That is all I wish for. The end. But instead everyone thinks I'm evil and irresponsible. Wha?! I've had 4 c-sections. After my last one my OBGYN said it would be unwise for me to have anymore pregnancies and explained the risks...I had lots of scar tissue 4th time around and after they did the incision I heard him remark "Oh goodness! What have we got here? "...It took 25 minutes for them to get baby out as opposed to about 3 with my first. I won't be going through that stress again but thankfully, 4 was all we planned on. Having said that, I have a friend who just recently had her 6th c-section and was given the all clear to try again...so I guess it varies from individual to individual.